Learn why Darwin is so irrelevant when dealing with human beings. Discover why all children, of all races, everywhere on earth, are truly born equal, possess comparable potential, and must be accorded equal opportunity, nurturing, and respect. 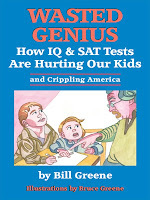 Wasted Genius takes a new look at how we raise our children and shows the harm done by the inflated role given to test scores and school grades. Based on recent discoveries on how our minds develop, the author explains the relative importance of the four factors that shape each person: human nature, the environment, genes, and free will. Greene has coined the term “TCQ” -- a new yardstick to measure all of a child’s abilities--capabilities that go beyond IQ, EQ, and people skills--aptitudes that our schools and colleges are neglecting. 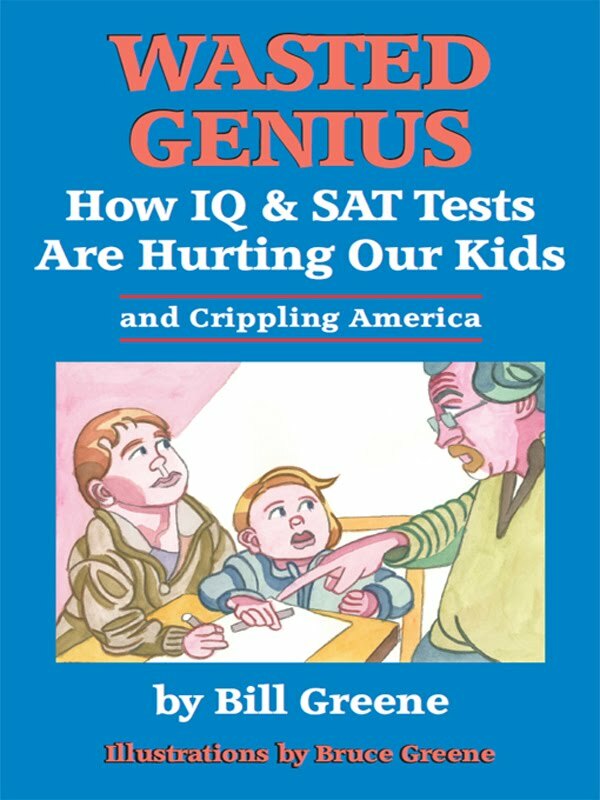 Current standards reward “test-taking” ability while neglecting the real objective of schools--to teach everyone the basic skills required to survive in the modern world. Margaret Tuchman's fine book The March of Folly reveals mankind’s propensity to follow disastrous policies to their most adverse ends. Her book, written in 1984, is about some of history's greatest blunders, and apparently has gone unnoticed by today's leaders for folly still permeates the world's capitols and the minds of those in power. The first decade of the new millennium, rather than showing a return to any measure of common sense, has indicated a continuation of folly among our leadership elites on the grandest scale. In my new book, Wasted Genius, I attribute much of such folly to the rise of a new Ruling Class that is distinguished by their love of abstract concepts and theoretical reasoning which they arrogantly maintain is superior to the practical reasoning and simple common sense employed by the majority of Americans. Angelo Codevilla has written about how this new Ruling Class elite stands in stark contrast to the "Country Class" which includes most of the hard-working, less educated mass of common people. And, yet it is that country class of workers who make America run while the elites merely advise, criticize, commentate, and then initiate the disastrous policies that are bringing America to its knees and bankrupting the future financial well being of our children. This new ruling class has been created by an educational establishment that maintains an almost religious Faith in the supreme importance of test scores and school grades. School policy and college selection has become a slave to the unfounded notion that IQ and SAT tests indicate an individual's worth. In fact, they merely reward abstract thinkers and hold back the practical minds needed to restore America's success story. The tests are the darlings of academics and school teachers who like the ease of use and their seemingly scientific basis. Not to mention that a theory "proving" the stupidity of their students relieves the teaching establishment of responsibility for results. This long-standing infatuation with tests has been further cultivated by intellectual wanna-be’s who enjoy feelings of superiority, even if such pride is based simply on a good memory, a quickness with words, and well developed test-taking skills. And yet such academic virtuosity represents only a fraction of a person's total competency. We are neglecting the education of many superior students that possess more of several other essential cognitive abilities unmeasured by today's favored tests. Because Americans have been hood-winked into respecting academic grades and abstract thought, and subordinate their visceral common sense to the apparent expertise of over-educated theorists, we have become dominated by a ruling elite that may appear very “bright” but is, in fact, subject to the worst kinds of folly. If there was a tipping point to this victory of abstractions over sense it may have been during the administration of Woodrow Wilson, the very revered and intellectual Princeton professor who (count these follies!) managed to launch us into “the war to end all wars,” invigorate the Progressive movement of big government, establish the IRS and Federal Reserve System, dream up the impotent League of Nations, and sign off on a Treaty that so crippled Germany that a subsequent World War became inevitable. No wonder the egg-heads loved him--he created a future for all the bright kids that didn't want to get jobs in the real workplaces of America. Only an intellectual possesses the conceptualizing flexibility to believe in “a war to end all wars.” Similarly, it is primarily a mind crippled by abstractions that finds sense in such lofty phrases as “a war on poverty,” a war “to spread democracy,” a mantra about "hope and change," or foreign aid programs that give billions of dollars to dictators to “help” third world countries. We currently are hearing an impossibly nuanced explanation about why our planes are bombing people in Libya--the administration claims to be "walking a fine line over the end game of the assault." It is avoiding for now any appearance that it aims to take out Gadhafi or help the rebels oust him, instead limiting its stated goals to protecting civilians, notwithstanding the fact that our bombers are killing many of those they seek to "protect." We have just recently seen the folly in domestic affairs where our leaders in Washington took on a mission impossible--to boost the commendable goal of home ownership by subsidizing mortgages to individuals with little prospect of ever repaying the loans. Of course, this folly may have been perpetuated more by cupidity than by stupidity because the Ruling Class insiders stood to benefit financially by the conspiracy between bankers and politicians who rode the bubble in real estate to obscene profits and then dumped off the losses with securitized packages of worthless paper to unsuspecting investors, and ended by bailing out any favored insiders who got caught holding the worthless paper they had not yet succeeded in dumping on the public. Only those with the cognitive agility to take great leaps of conceptual fancy will advance those kinds of incredible ideas as national policy and then forge ahead, convinced of the soundness of their reasoning, confident of the veracity of their theoretical justifications, enthusiastic with a confidence undiminished by any lack of positive results, oblivious or in denial concerning the adverse unintended consequences of their actions, but still managing to line their own pockets through it all. Such persistence shows that this well-connected elite is empowered by an intellectual arrogance, a conviction that their critics are wrong and mean-spirited, and that the sheer power of their own intellect anoints them with the right to profit and rule over the common people, the Country Party to use Professor Codevilla's words, or what we have historically referred to as grass roots America. Those are the kinds of minds that have usurped power in America. It is their new way of thinking that has reduced our leadership to community organizers, agitators, Wall Street speculators, and other self aggrandizing groups representing, not the ordinary people of this country, but the insiders concentrated on ripping off for themselves whatever they can get away with. Unfortunately, many well meaning voters are in thrall to the supposed expertise of these frauds. And many voters are swayed by the promises offered, whether they be public employees, farmers, union members, grant recipients, subsidized businesses, or all the recipients of government hand-outs. Out of this muddled blend of self-interest and self-righteous compassion for others, half the country supports this elite's call for expanded government bureaucracies--even if the consequences bear constant witness to their folly. Why Does Our "Naive" President Surround Himself with Wall Street Insiders! "During the S&L crisis two decades ago America had a backbone, indicted 3,800 executives and bankers. Today’s leaders have no backbone. Besides jail time won’t reform the darkness consuming Wall Street’s soul. We’re all asleep, in denial about the moral crisis facing America. Yes, we need a new revolution. "Jail time? We’ve heard that many times before. Journalists have been beating that dead horse for three years. Jailing CEOs made sense in early 2009. But our naïve president missed that opportunity, instead surrounded himself with Wall Street insiders as Bush did with Blankfein’s predecessor. Trojan Horses manipulating a Congress filled with clueless Dems mismanaging tired Keynesian theories. "Taibbi got it right: Washington’s error was in protecting Wall Street’s billion-dollar crooks when they should have been prosecuting CEOs for criminal behavior in getting us into the 2008 mess. So today, the political statute-of-limitations has run. Jail solution is wishful thinking, like praying to the tooth fairy for a miracle. Time for action. Time for a revolution on Wall Street." The fact that this important news comes from Rolling Syones and not the mainstream media indicates part of the problem: The American public is being perpetually misled by an elite group of leading politicains, financiers, and the media. But Tibbi reports the real stuff: "Put Goldman Sachs CEO Lloyd Blankfein in jail for six months, and all this will stop, all over Wall Street and America, a former congressional aide tells Matt Taibbi in his latest Rolling Stone attack, “Why Isn’t Wall Street in Jail? Financial crooks brought down the world’s economy — but the feds are doing more to protect them than to prosecute them. "Taibbi’s right, everyone knows Wall Street’s run by a bunch of dictators who are doing more damage to democracy and capitalism than North Africa’s dictators. But jail the CEOs of Goldman, Citi, B. of A. or my old firm Morgan Stanley? Too late." It is incomprehensible why Obama keeps Goldman Sachs officials heading the United States Treasury Department and bails out the biggest wrong-doers on Wall Street. His administration paid out hundreds of billions of dollars to bail out the perps. Of course they were all major contributors to his campaign coffers. Why else would a Democrat, a self-described man of trhe people, sleep with the enemy?